post them! I went to TRU/target/walmart today. 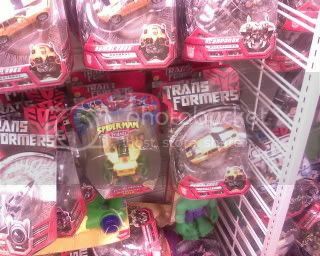 it was pretty empty..
Walmart is still pretty empty but Frys has ALTERNATORS!!! the red jeep, black wrx, scion and dodge ram. i did however pick up the last ram. KOHLs in Sneillville have deluxes: Barricade, Brawl, Jazz, among others. I picked up the last BBee. tru in buckhead had payload, dreadwing, final jazz, arcee, 2008 BB, longarm, brawl, barricade, bonecrusher, some replicas, protoforms, voyager prime and megs. ZedzDead wrote: tru in buckhead had payload, dreadwing, final jazz, arcee, 2008 BB, longarm, brawl, barricade, bonecrusher, some replicas, protoforms, voyager prime and megs. You gotta be kidding! I was there last Wednesday, they had crap for Deluxe figures. That's how it goes I guess. Check the Cobb TRU. They had Arcee, Payload, BD Jazz, and Longarm two days ago. all i have scene is some signal flares and long arms at the target in douglasville. I went to KOHLs today, they had EVERYTHING!!! I bought 3 08 BBees!!! screw TRU, Walmart & Target, GO TO KOHLS!!! which kohls did you go to? I went to KOHLs in Duluth. Another GA member just bought a bunch of deluxes there including 2 BBees. I believe they are now out of BBees. U may wanna try other KOHLs. jezones wrote: which kohls did you go to? ttman wrote: I went to KOHLs in Duluth. Another GA member just bought a bunch of deluxes there including 2 BBees. I believe they are now out of BBees. U may wanna try other KOHLs. I was just at the Duluth Kohl's... there are at LEAST 8 or 9 BB 08's, 5 Arcees, and a few Dreadwings. The Kohl's on Peachtree Pkwy (near Johns Creek) - same story. They have a LOT of BB 08's and I found the one lone BB74 and bought it. It's like they can't give the deluxes away at the stores. I hope they get in the newest wave soon. Here are pics from the Duluth store I took on my phone. That's four different BB's in the shots. A Dreadwing can be seen in there too. And in the second pic, you can see the Arcee behind Dreadwing. Last edited by avalon_sinclaire on Thu Aug 16, 2007 9:27 pm, edited 1 time in total. 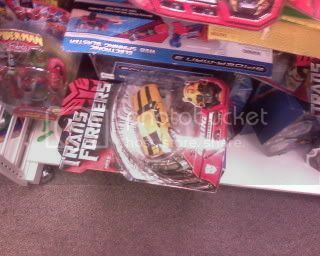 i just picked up 08 Bumblebee, Acree, Swindle, and Dread wing at the kohls in Douglasville. They had 08 Bumblebees, swindle, wreakage, dreadwing, Bonecrusher, and Acree. It was amazing seeing that many Deluxes in one place. For a second i thought i was in a toy store, but then i relized i was at kohls. 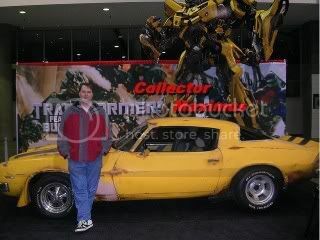 The women was surprised to see me careing all those transformers. She asked me if i was a collector and then started telling me about her collection of old model cars. It was cool she understood the collectors mind set. well I guess dat settles it, KOHLs FTW!!! Is that the one off 85N at Steve Renolds? DevastaTTor wrote: Is that the one off 85N at Steve Renolds? Thanks again. I'll be checking on my way home from work. walmart in douglasville has classic deluxe Rodimus, cliff jumper, grimlock, Mirage, Ramjet. And Classic Voyager Jetire, Optimus Prime. 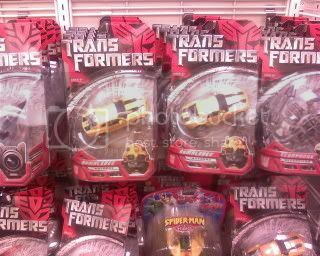 Walmart in lithia springs had the 74 Bumblebee and Barricade two pack. I gave the toy lady the DCPI numbers and she pulled them from the back. The 2 Buckhead Targets also have stock but they are holding until Sunday...so arrive early! North Point Alpharetta Target has them too. I got them the same way. I don't think they put any out but I would check asap. Also I know this is late, but wednesday Kohls on highway 92 in Roswell had a deluxe Arcee and dreadwing. Doubt they are still there but worth checking. Target oh Highway 92 in Woodstock had 5 G1 movie starscreams at lunch time yesterday. There's also a Kohl's in that shopping center which had several Concept BB's, Arcees and Dreadwings. i found three leader class brawls if anyone wants to know where they are just p.m. me. well now there are only two. 495. Ultra Magnus (War Within) Aug 26, 07 8pm Target Tucker, Georgia only 6" titanium in sight! 490. Optimus Prime and Blackout Aug 26, 07 8pm Target Tucker, Georgia 0 remaining got it! 487. Ratchet Aug 25, 07 1am Wal-Mart Supercenter Roswell, Georgia 2 remaining must have just put these out! 4,451 pages were recently viewed by 853 unique visitors. This page was viewed 1 times on Saturday, April 20th 2019 7:45am CDT. © 2019 Seibertron, Inc. DBA Seibertron.com. All Rights Reserved. Established June 2000. Seibertron.com is owned by Ryan Yzquierdo.